Blackleg disease is on the rise. Research scientist Gary Peng, with Agriculture and Agri-Food Canada (AAFC) in Saskatoon, says tighter canola rotations have meant an increase in virulent races of the blackleg pathogen. 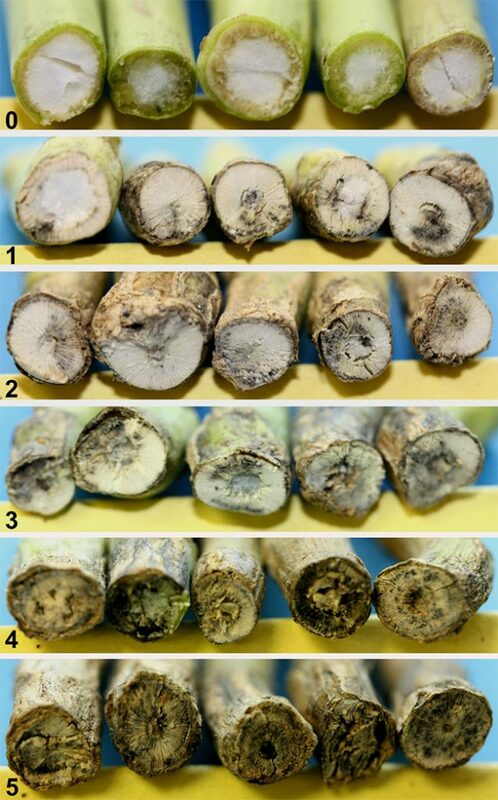 However, properly identifying the disease through scouting will help canola producers assess their risk of blackleg on each field to help guide them when selecting blackleg-resistant hybrids. “Producers need to first scout their crops for the disease and know how to identify it. If they are able to find significant levels of the disease they then need to make sure they are growing a R/MR variety and look at extending their crop rotation,” says Justine Cornelsen, Western Manitoba agronomy specialist with the Canola Council of Canada (CCC) at Onanole, Man. The best time to survey a crop for yield loss from blackleg is just prior to swathing or straight cutting. Pull up at least 50 plants in a “w-pattern” starting at field’s edge. Cut the base of the stem/top of root and look for blackened tissue inside the crown of the stem. Peng developed a pictorial guide to help farmers assess the level of disease. His Blackleg Field Rating Scale runs from zero to five and helps provide an indication of the severity of the disease. “If you don’t have major blackleg damage, there’s no urgency for you to switch between resistance groups right away,” Peng says. The Blackleg Steering Group (BSG), chaired by the CCC, has been working to help producers reduce the impact of blackleg. Previously a risk assessment matrix was used. The matrix is being discontinued and a simplified, step-by-step procedure is being developed for managing the disease. Cornelsen says the main recommendations are a continued emphasis on crop scouting and lengthening the crop rotation for managing blackleg. Rotation of different R-gene groups needs to occur when there are significant blackleg levels within a field. “We recommend that producers monitor crops yearly to determine if blackleg levels are changing. If blackleg is not an issue, there is no need to rotate your variety to a different group,” Cornelsen says.